Scientists in Hong Kong have recently discovered a virus that may be one of the causes of kidney disease in cats. This newly discovered virus is a member of the Morbillivirus family, which also includes measles, mumps, and canine distemper. Feline morbillivirus has been linked to a form of kidney disease called “tubulointerstitial nephritis,” a condition characterized by inflammation of the spaces between the tubules (tubes that carry the urine for filtration). While there are many factors that can contribute to this problem, the cause in any given cat is rarely determined. Study researcher Kwok-Yung Yuen says, “All dogs are vaccinated against the canine distemper virus, because the dog morbillivirus can cause very severe disease in dogs with fever, pneumonia, brain infection, immunosuppression and rash. 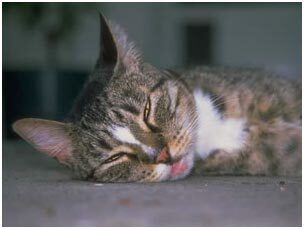 Despite the close relationship between dog, cat and human, no morbillivirus is found in cats yet. And one of top causes of death in cases due to nephritis leading to kidney failure is quite unknown.” When Yuen and fellow researchers went looking for feline morbillivirus, they found it. Of 457 stray cats, 56 (12.3 percent) carried the virus, and 27.8 percent had antibodies to the virus, indicating a previous exposure. When post-mortem exams were conducted on 27 deceased cat, 7 of the 12 cats that were positive for the virus had tubulointerstitial nephritis. Of the 15 “clean” cats, only 2 had kidney damage. This virus is not dangerous to people, but could be vitally important to cats worldwide, including the 80+ million housecats in the United States and Canada. Yuen says, “We are now working [to learn] the relative risk of kidney involvement in those cats infected and testing for antiviral agents. We are trying to set up animal models for vaccine studies.” The research appears in the Proceedings of the National Academy of Sciences.